Festival lasts May 24-27, 2019 and includes a carnival, car show, softball and horseshoe tournaments and more. 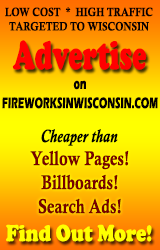 Donations for the fireworks can be sent to Oconto Falls Booster Club, 328 Union Ave., Oconto Falls, WI 54154. Please include contact information.